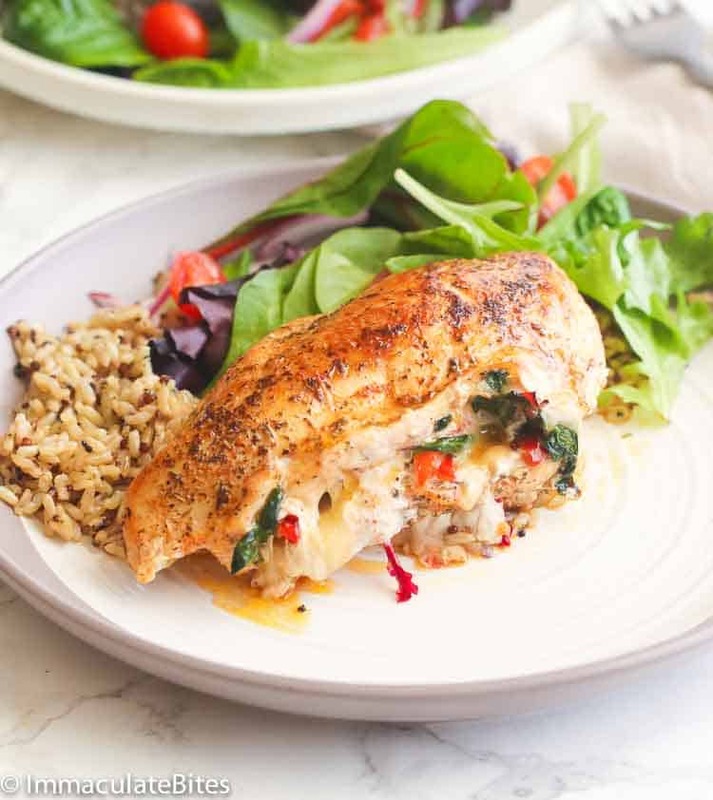 Stuffed Chicken Breast – juicy boneless chicken breast stuffed with red bell peppers, fresh baby spinach and cheese. 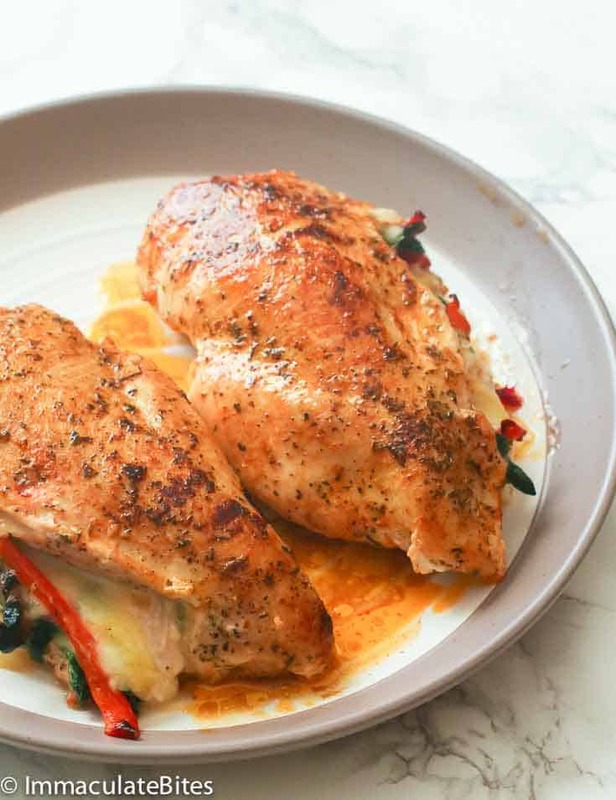 A savory blend of cheese and vegetables; best way to spiced up your usual chicken dinner night. Incredibly easy, cheesy and delicious. Great for entertaining, too! This is one of those recipes that you”ll love for years to come. It’s pretty easy to make and veeerrry versatile. And trust me when I say it’s very versatile. You don’t actually need a recipe to whip this up. The variation is endless and pretty much you can stuff it with whatever you want, in case you don’t have the exact ingredients listed on this recipe. As long as you have boneless chicken breasts, oil, cheese and veggies of your choice – you’re good to go! 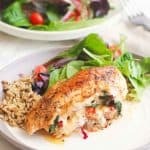 If you’ve been cooking chicken breast the same way over and over again, you seriously got to add this Stuffed Chicken Breast on your dinner repertoire. It’s pretty customizable to your liking and so easy to whip up – very straightforward. Since I have leftover mushrooms from my last recipe – Crab Stuffed Mushrooms – I decided to saute this bell peppers and baby spinach as a healthy stuffing for my lean boneless chicken breast. You see the pattern here? I’ve been doing a couple of stuffing recipes lately. What can I use other spinach? But if you don’t have spinach, you can swap it out for finely chopped broccoli florets, olives, fresh herbs, dried tomatoes, pickled vegetables to bacon and sausage – endless possibilities. Your call! 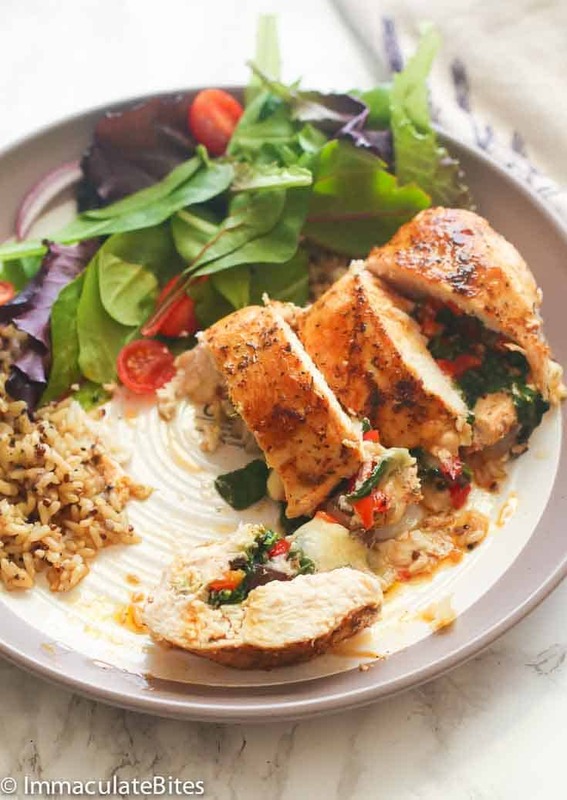 The stuffing of this chicken makes this dish bursting with flavors. It’s an absolute symphony of flavors and a full balance of protein and vegetables. Got a picky eater? This is a great way to hide all those veggies and make him eat it. They’ll going to love the presence of cheese inside and the well-seasoned chicken. And if you’re on a low-carb diet, this one’s for you. I mean, could there be anything better than a lean chicken meat and some veggies? It comes ready in under an hour. 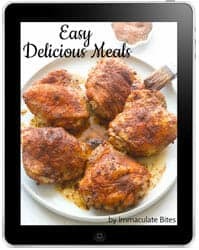 This makes a delicious weeknight family dinner OR even a fancy fine-dining experience , just in time for Valentine’s Day .It sure will impress your boo! Moist, rich, flavorful, easy and surprisingly healthy. What more could you ask for? Pair with your favorite fried rice or salad, and you’re all set for a lovely guilt-free meal! Stuff more! Enjoy! In choosing the chicken, go for a relatively thick cut meat. Avoid buying those packs with labels such as fillets, thin-cut or tenders. If you only have frozen spinach, make sure you thaw it first and squeeze out any excess water. You may substitute provolone cheese for mozzarella or any dry-semi soft cheese like cheddar and even Gouda, too. To best test for doneness of the meat, insert an instant read meat thermometer. Insert the thermometer into the thickest part of the chicken breast and it should read at 165 F or 74 C. If you don’t have one, just pierce the chicken with a knife and if the juices run clear, that’d mean it’s done. Salt chicken inside and outside . then season both sides of each breast with the Italian and creole seasoning. Place chicken on a board or flat surface . Cut a slit or pocket about ¾ quarter of the way through each breast, try not to cut all the way through . Season inside of chicken. In large skillet or frying pan, add olive oil and garlic, sauté over medium heat for about a minute, add mushrooms, bell pepper and continue stirring for about 2-3 minutes. Finally add spinach and stir frequently until wilted and cooked, about 2-3 minutes. Set Aside. Stuff chicken breast with mushroom, spinach and bell pepper mixture. Add cheese, 1-2 slices per chicken. Use toothpicks to thread chicken breasts near the openings to help secure them. If some of the filling has comes out, just tuck it back in. Heat an oven proof skillet over medium heat with a tablespoon of oil. Sear and cook chicken on both sides for 3-4 minutes each, until golden. You may use a pair of tongs, and carefully flip the chicken breasts over. Place skillet in the oven and cook for about 16-18 minutes, depending on the size of the breast or until chicken is cooked through. 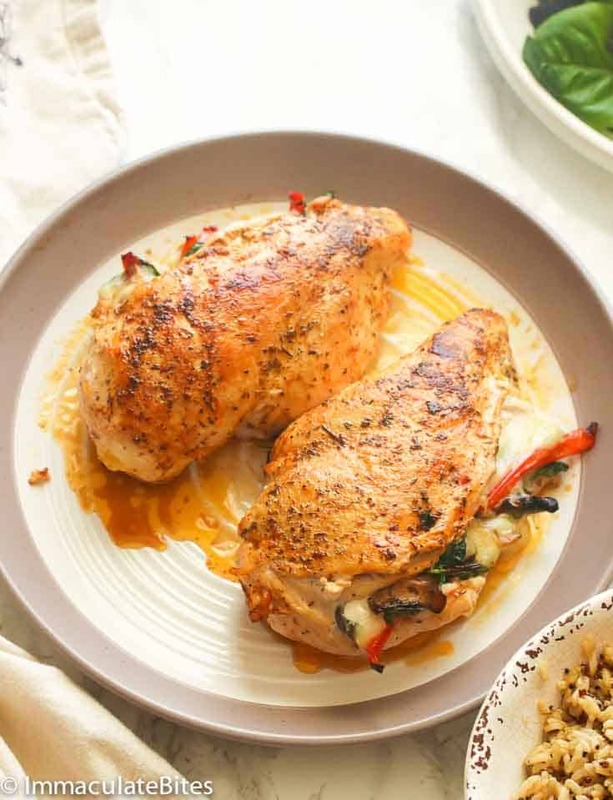 Transfer the chicken breasts to serving plates. Carefully remove and discard the toothpicks. Serve immediately., drizzled with the juices in the skillet. Please be reminded that the Nutritional Information shown in the post is a rough estimate and can vary greatly based on products used. Preheat the oven to 375 degrees F (190 degrees C). Salt chicken inside and outside. Then season both sides of each breast with the Italian and creole seasoning. Place chicken on a board or flat surface . Cut a slit or pocket about ¾ quarter of the way through each breast, try not to cut all the way through. Season inside of chicken. Stuff chicken breast with mushroom, spinach and bell pepper mixture. Add cheese, 1-2 slices per chicken. Use toothpicks to thread chicken breasts near the openings to help secure them. If some of the filling has comes out, just tuck it back in. Heat an oven proof skillet over medium heat with a tablespoon of oil. Sear and cook chicken on both sides for 3-4 minutes each, until golden. You may use a pair of tongs, and carefully flip the chicken breasts over. Place skillet in the oven and cook for about 16-18 minutes, depending on the size of the breast or until chicken is cooked through. Transfer the chicken breasts to serving plates. Carefully remove and discard the toothpicks. 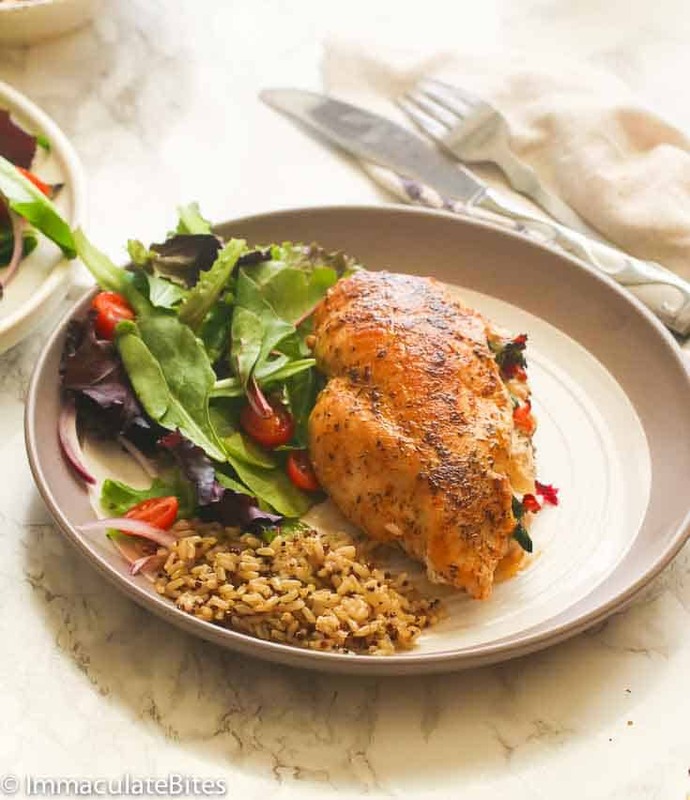 Serve immediately and drizzled with the juices in the skillet. I’m trying this tonight! Can’t wait! Enjoy, Wendy! Please do let me know how it turned out for you. Fantastic! Came out better than expected. This recipe will be a regular at my house! Yaaay! Thanks for letting me know. What can I use besides an oven proof pan? Baking sheet, cast iron, casserole. 2-3 teaspoons minced garlic would work. Thanks for bringing this to my attention , recipe updated. Excellent! Made my own creole seasoning and used oregano and basil for italian seasoning. Did not have provolone cheese on hand so used muenster. Very moist with savory flavor. Thanks for sharing those tips, Mona. That sure sounds lovely. Thanks for stopping by! You are my to go girl for innovative cooking. So simple yet so savory! 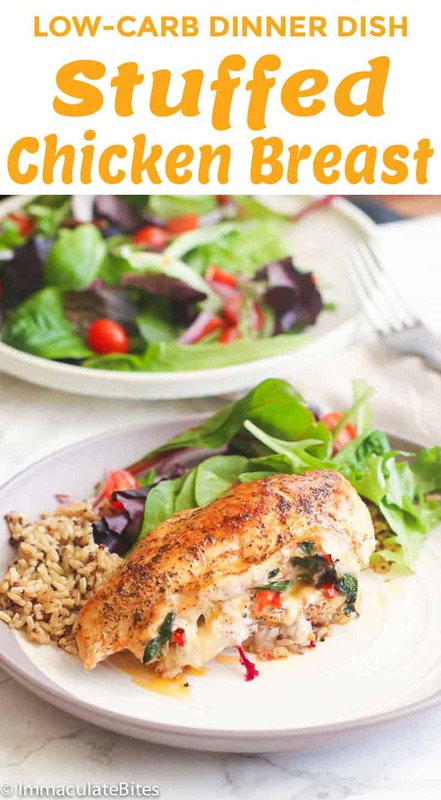 Haven’t tried it yet but this chicken breast looks yummy can’t wait and the nutrition guide is right in range Good Job! you deserve 2 thumbs up! OMGGGG.. I tried this with my own seasonings, but was still so juicy and delicious. Thanks a bunch. Muah!!! YESS! Thanks for the feedback! Tried this the other and my picky eater hubby enjoyed it and so did I — yummy I will be making this again— thank you! I will be trying this tomorrow. 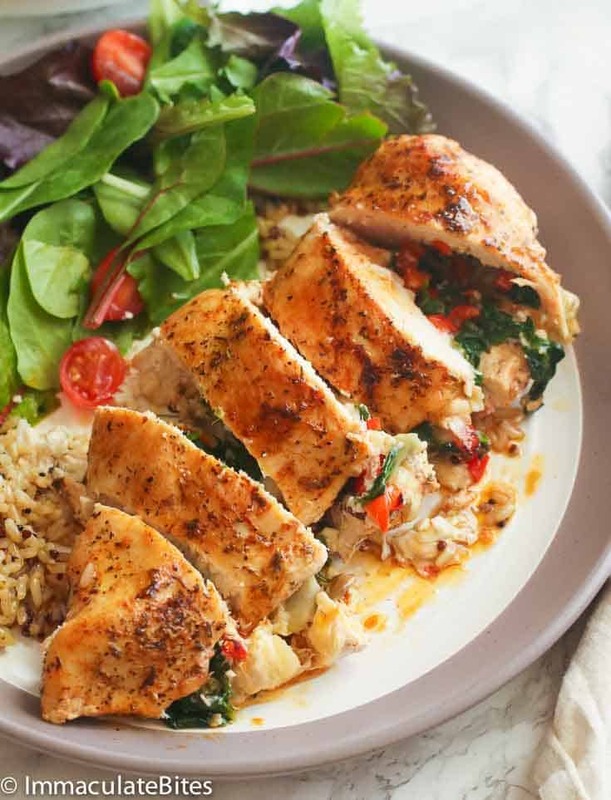 I really don’t like to cook with chicken breast that much because it can be dry but this looks juicy!!!! It sure is. Comes out perfect every time!